But while Mrs. Leo M. Frank (Lucile) and her mother Josephine Selig were attending the last matinee performance by the visiting Metropolitan Opera — of Lucia di Lammermoor — a different script was playing out in a dingy and shuttered 4-story building on S. Forsyth Street. What occurred in the National Pencil Co factory on that holiday afternoon would become a permanent and dramatic part of American legal, social, and political history, much of which is still not adequately explained after 95 years. The 4-week Trial begins on July 28 with a jury of 12 men. This Site will present information and documents about the murder of Mary Anne Phagan (1899-1913) and possible solutions to the crime. We will analyze the Inquest testimony, the Court record, and much other original material in an attempt to finally explain what most likely happened at 37 Forsyth Street on Confederate Memorial Day, 1913. The basic books on the case will also be reviewed, including the most recent And the Dead Shall Rise. We welcome comments and suggestions, which may be sent to the Webmaster. Leo’s letter to his uncle Moses Frank, dated Apr 26th: Click for larger version.The first “new” document, shown at the right, is the letter (Def. Exhibit 42) that Leo Frank purportedly wrote to his uncle Moses Frank (then staying in a NYC hotel) on April 26, and which his lawyers argued showed his calm state of mind at the time (“anything startling…”). Reuben Arnold (pencil in hand in above sketch) would argue at the Trial that it was written by Leo literally between 12 – 1pm that Saturday. Almost without exception, every book on the case (Golden, Connolly, Frey, Melnick, Oney) has referred to the “thin gray line” and stated that Leo’s “interested” uncle was himself once a Confederate soldier. However, extensive research reveals that Moses Frank never served in the US military, North or South, nor do any of his obituaries or eulogies (1841-1927) mention such a record despite a much later family belief. 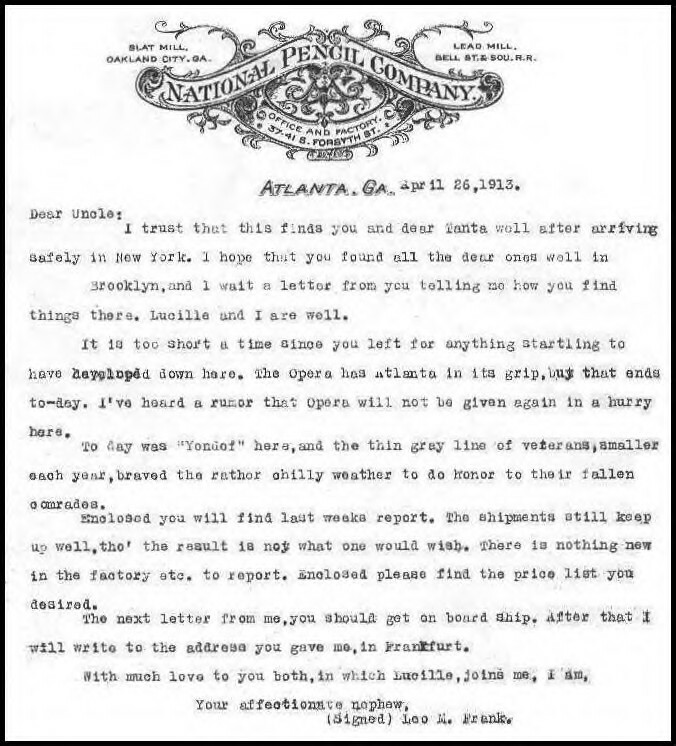 Moses Frank, an 1856 immigrant from Dudelsheim in Hesse-Darmstadt, had lived in Atlanta, on and off, since 1866 (when he married his first wife Jane Wilson Kelly), and had even been in that city the very week of April 21st (with his second wife Sara) – why was he being kept up to date so carefully about this regular annual event (“Today was Yondeff”)? Moses was about 72 at the time and would hardly need to be reminded of his own mortality (“smaller each year”)? In a Mar. 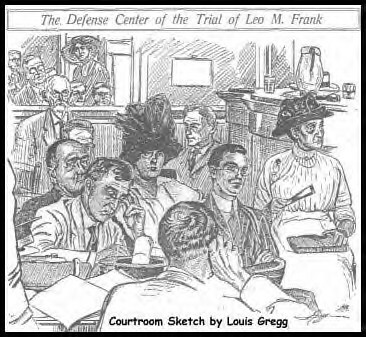 1914 jail-house interview, Leo Frank would not say that his wealthy uncle was a Confederate veteran, nor was this possibility ever broached at the Trial (it was suddenly offered – without proof – only in Oct. 1913, by Reuben Arnold). The location of that handwritten original, though shown in Court, is unknown and no photographic image of it survives. Solicitor Dorsey implied to the jury that this “exculpatory” letter was not sent at its apparent date or time, an issue entirely ignored in the extensive Leo Frank literature. Curiously, no one at the Trial (or later) ever referred to the fact, or the reason, that his uncle had been blind since 1907. And despite the mistaken claim of his presence in the Frey book (‘The Silent and the Damned’), Moses Frank was continuously absent from Atlanta for over 3 years (Apr 21, 1913 – Oct 1916). However, his exact whereabouts between Apr. 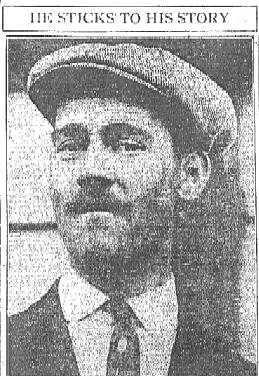 28 and mid-Sept of 1913, is still unresolved; he and his wife were ‘unavailable’ for the Trial and Rae Frank alone (in Aug.) said he was already ‘in Europe’ from where she had been sent Leo’s ‘Apr. 26’ letter (the outer envelope from ‘overseas’ was not produced). He did not arrive in Frankfurt until Sept. 15, 1913. 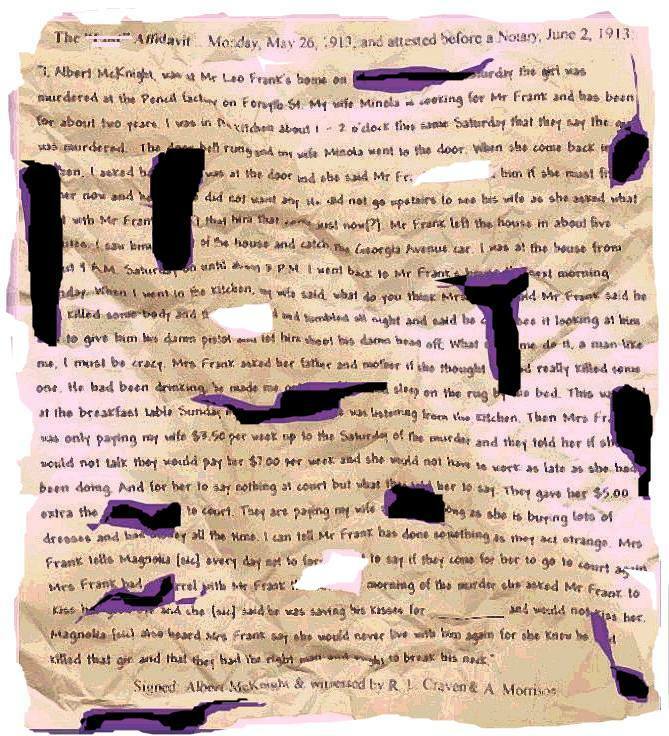 Albert McKnight’s Affidavit of May 26th 1913. One of the most intriguing circumstances in the pre-trial development of this case involved a document signed by the black cook in the Frank/Selig household (Minola McKnight). Frank’s attorneys, would long argue that it was coerced by the police as a result of “third degree methods.” Since 1913, it has never been shown in its entirety, and we are glad to present it here. Also unmentioned in the last 9 decades is the sequence of events that led up to its appearance. Minola would make three affidavits in all (May 3rd, June 2nd & 3rd), but her over-night incarceration was specifically caused by her husband Albert’s statement made on May 26, and notarized on June 2nd (at the left). This description of events has never been cited, with only an oblique reference in the Samuelses’ Night Fell on Georgia (1956). The most striking sentence (and odd omission) is shown here for the first time: “Mrs. Frank had a quarrel with Mr. Frank the Saturday morning of the murder she asked Mr. Frank to kiss her good bye and she said he was saving his kisses for _______ and would not kiss her.” Readers may wish to consider its authenticity, as new light is shed on why Leo Frank “so thoughtfully” bought his wife a box of chocolates from Jacobs’ Pharmacy just before returning home at 6:30 pm on April 26th. Foreman Lemmie Quinn on May 8.In his first recounting of Saturday’s events (with his lawyer’s approval), Leo Frank made a formal statement on April 28th. This response is usually portrayed as a continuous document, but it was actually derived from a series of detailed questions and transcribed in the police station that Monday morning. Totally unmentioned, by accident or design, was the ‘noontime appearance’ (Sat) of Lemmie Quinn, the long-time Metal Room foreman and Mary’s immediate boss in the Tipping Dept. Yet, in a surprise announcement on May 5th (at the Inquest), Leo Frank would claim that Mr. Quinn saw him at his office desk around 12:20pm, in a supposed (and failed) attempt to speak with (absent) head clerk Herbert Schiff (about a baseball bet). Coroner Donehoo was surprised at this sudden revelation, and he did not apparently know of Quinn’s previous statement to Mrs. Coleman (Mary’s mother) that he had not been at the factory at all that day. Nonetheless, despite contradiction from several detectives, Quinn would also insist at the Trial that he was indeed at the factory’s 2nd floor and saw no one inside but Frank (just minutes, presumably, after the murder). Leo had at first only said that he paid Mary her wages of $1.20 at 12:07pm – she was never seen again. How (and exactly when) Quinn’s helpful information came to light was never adequately explained. Another remarkable element of this case involved the testimony of the black janitor, Jim Conley. There is much misinformation about him (both then and now), and even his age (27 or 29?) and (educational) background are given incorrectly by Steve Oney in his recent book. Jim was not born in Atlanta, he did not have two years of schooling (he was not listed as ‘literate’ in the 1900 Census), nor were his parents alive or working at Capital City Laundry in 1913. Although his own date of death is given as 1962 (by Harry Golden), no obituary or death certificate has been found for him. 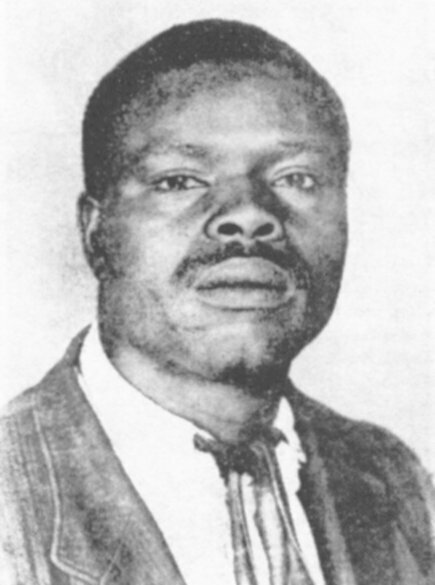 His last surviving sister, however, died in 1969 (from the original family of ten children). The report concerning a gun fired at Lorena Jones, Jim’s common-law wife, cited on Oney’s p. 120, is not factual and was based on a rumor deliberately spread (June 6) by Benjamin M. Brodie, in response to the recent Minola McKnight affair. Jim Conley’s official Arrest Record (w/ 7 offenses) was offered as ‘Exhibit T’ at the Trial, and was accepted as accurate by both sides; it does not show any such episode. Nor was the “incident” ever mentioned by Frank’s own lawyers, either at the Trial or during the numerous Appeals. How Conley was able to maintain his employment (despite his bizarre ‘sprinkling’) at the pencil factory for over two years (earning $6.05 per 55-hr wk) is an ongoing mystery, as well as why Leo Frank continued to review his many private watch-installment contracts. 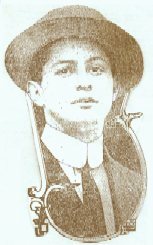 A Program on the Leo Frank Case (with new documents) was presented at Brooklyn College on October 18, 2006 (IRPE) and on Faculty Day in May 2009. For more information on the Leo Frank Case, visit the url www.LeoFrankCase.com and be sure to sign up for the best Leo Frank discussion forum in the world, visit the url http://groups.yahoo.com/group/LeoFrankCase/ This is a friendly place to discuss the famous case of Leo Frank and Mary Anne Phagan (1913-1915). Although most modern publications have rendered their verdict, there is still some room for reconsideration. Let us know your thoughts. The original Trial Transcript has been ‘lost’ since the 1960s, but there are several ways to approach this continuing problem. The picture at right shows the cover of the Avon edition of the fictionalized ‘Death in the Deep South’ (which was made into the 1937 movie ‘They Won’t Forget’). The National Pencil Co. on S. Forsyth St. in Atlanta, was eventually replaced with the Sam Nunn Federal Center. It (National Pencil Co.) had been founded here in 1908, with the help of Leo’s uncle, Moses Frank, in the old Venable Building (briefly the Granite Hotel), and at the time of the crime (Confederate Memorial Day), had about 170 employees on three floors (2-3-4). The Clark Woodenware Co., on the first floor for 2 years, had recently departed, in Jan of 1913 (Montag’s had left in 1908 for nearby Nelson St). Original pencils are eagerly sought.